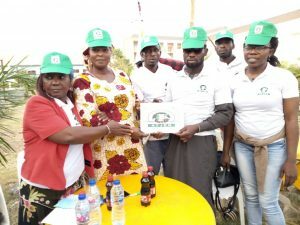 Youth group under the auspices Association of Youths for Justice and Equal Rights AYJER, has urged Nigerians to vote for credible candidates who would move the nation out of economic struggles. 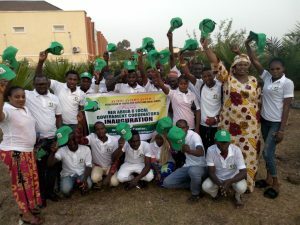 Speaking during an official inauguration of its Abuja Coordinator at wuye city center AMAC LGA, National welfare director and Co-founder of the group Princess Sucess Okeze stated that Nigerians must begin to consider the future of the country, adding that act of vote buying should not be recorded in the 2019 election. Okeze, who advised the electorate to be peaceful during the election stressed the need for Nigerian youths not to allow themselves to be used as political thugs in the hands of politicians. ‘’The election is coming up and a lot of Nigerians do not know their rights, we should know that the power to decide is in our hands which is our PVC. As a Nigerian you know what is right and that is what you should do on the 16th of February and march” she said. She however urged the newly inaugurated Abuja coordinator to discharge his duties in line with the aims and the objectives of the group. The newly inaugurated Abuja coordinator for AYJER is Mr Adams Yusuf Shaba from Nassarawa state. He will in turn inaugurate 5 others to represent the other LGAs of abuja. Ayjer is established with the aims and objective of uniting all youth in Nigeria together, under an umbrella to speak in one voice, stand for our right without any fear of injustice, and also make sure all youths have their vote under one umbrella to elect the right leaders that will deliver the mandate of all the people by the people and for the people for a reform, and also to discuss and negotiate the need of the youths with a common interest and agreement. Ayjer is looking forward to a great and a better Nigeria nation, where the voice of the youth will be heard, where our vote will count, where the rule of law will prevail, where unemployment benefit will be given to the young graduates after NYSC service for a period of 6 to 18 months, to create between 2 to 5 million job opportunities every year to benefit graduates as well as the Area boys, the less privilege to give them a brighter future. To introduce adult education where the less privilege can be educated as well as the Agbero and Area boys. Also Working For A Better Nation AYJER is poised with the mandate to Promotion, Protection, Preservation of the principles of justice, equality and transparency. Voice of the Youths. Improving the welfare of the youth socially, mentally and morally, academically and physically taking the youth off the street and empowering them with a vocational training, and, also inculcating the true role of leadership.